Bonita Springs Area Title Company Volunteers At “Halloween In The Park” in Bonita Springs. Looking for a fun TRICK OR TREATING venue in Bonita/Estero area this Halloween? Look no further then “Halloween in the Park”, sponsored by the City of Bonita Springs and B.E.A.R. (Bonita Springs Estero Association of REALTORS). Bonita Springs Area Title Company, Winged Foot Title’s, is proud to announce that Marian Rosencrans will be volunteering her time at “Halloween in the Park” on Monday, October 31, at Riverside Park in Bonita Springs. From 6:00PM to 8:00PM, kids of all ages can enjoy games, face painting and of course candy . . . lots and lots of candy! Marian will be passing out goodies at the Winged Foot Title table – Make sure to stop by and say “hello” (and of course “trick or treat”) to get some goodies for your halloween bag! 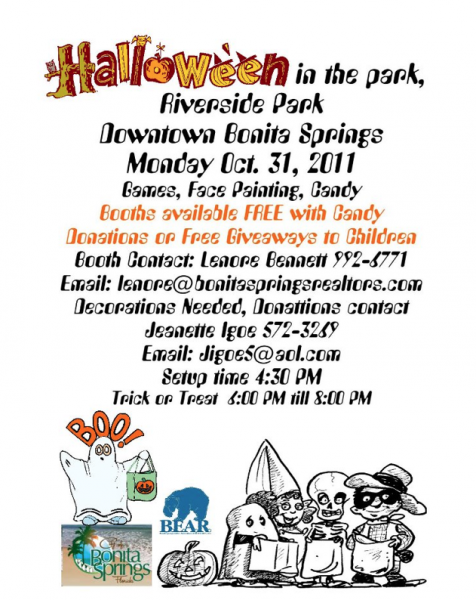 Halloween in the Park is sponsored by the City of Bonita Springs and B.E.A.R. (Bonita Springs Estero Association of REALTORS). This is Marian’s 3rd year of participating in the event designed to give Bonita Springs & Estero area children a safe and fun environment in which to Trick or Treat. Marian is delighted to have watched the number of children served swell from 400 her first year to over 1,000 in 2010. Need more information or have questions, please don’t hesitate to give me a call (239) 985-4142 or contact me online. Well we’ve made it. The girls – my wife Lydia and daughter Emerson – and I left Fort Myers late Tuesday and made it to Jacksonville before packing it in. We started slowly this morning but banked enough time for a quick pit stop in charming Savannah, GA.
We hit Savannah about lunch time. Online and friend reviews took us to Soho South Cafe, which lived up to its billing. Lydia had a Mediterranean grill; Emerson a PB & J; and I the salmon BLT on the recommendation of Liza, our server. The restaurant is an eclectic mix of furniture and art. Its only consistent design element within the warehouse shell is its inconsistency. We were reminded of one of our favorites from Philadelphia – The White Dog Cafe. The lunch crowd was part local – from lawyers talking their first cases before certain testy judges to businessmen – and part tourist. Overall a great spot for our first stop in Savannah. Savannah is a wonderfully walkable place – quite a welcome reprieve from what we are used to. We strolled from Soho South Cafe to Chippewa Square then snaked through side streets back to the wagon to get back on the road. We were not disappointed when we rolled into Charleston a couple of hours later..